Ride on Lawn mowers Northern Ireland, we deliver any county in Ireland at low cost - warranty info here. Lawnmowers for sale Northern Ireland from AM Rentals. We have been selling lawnmowers from our store in Newry since 1980. We specialise in all the worlds biggest names in mowers. 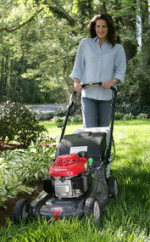 Our biggest selling ride on mowers are Husqvarna, Honda and Snapper. We supply conventional ride on mowers with the deck mounted in the middle of the machine and mulch capable ride on lawnmowers. We also supply a large range of Husqvarna front deck mowers at great prices with delivery all over Northern Ireland and Southern Ireland. We sell lawnmowers to satisfied customers all over Ireland, North and South. Our customers continue to come back to us due to our unbeatable service on Husqvarna ride on lawnmowers such as the popular Husqvarna TC142t tractor mower and the Husqvarna TC342t ride on mower . As well as having a wide range of ride on mowers in stock at all times we specialise in repair and servicing of all makes of ride on lawnmowers in Northern Ireland including, Honda tractors, Husqvarna lawnmowers, Snapper mowers, Oleo mac lawn mowers and John Deere lawnmowers. We have a collection and delivery service so we can pick up your machine, service or repair it in our extensive workshops in Newry and leave it back to you as good as new. We are authorised Lawn King from MTD agents, bringing a range of high specification Lawn King ride on lawnmowers to customers all over Northern Ireland. We have extended our showroom to accomodate this new range, call in today to see these quality European made ride on lawnmowers for yourself. We stock Billy Goat Leaf vacuums - click to see the range. As well as extensive knowledge of new machines we also repair and service your old lawnmower. Our shop in Newry has a fully stocked workshop for repairing all makes of petrol lawnmowers on site and with over 37 years experience in selling and repairing lawn mowers we have the expertise to back up our great mowers. We will repair all makes and models of petrol lawnmowers regardless of where they are bought. Our Northern Ireland next day delivery service ensures you not only get a great deal but you will be able to cut your lawn the very next day - given that your order for a new mower is placed by 12 noon. Click here to view our great prices on generators for sale from Newry. Brush cutters and Strimmers for sale Northern Ireland We have Stihl, Honda, Tanaka, Bluebird and Kawasaki brush cutters for sale from our Northern Ireland store. Our great prices are not only available online - they are also available in store. So call in today to grab a bargain on Stihl and Tanaka brush cutters.